Well, my award never came in the mail. Shocker. It’s time for our second swim lesson and I made sure to prepare. I ate well, got a good night’s sleep, and even took a short afternoon nap with Rose in hopes of looking refreshed and young enough to be her mother, not her grandmother. I score big this week and find an open parking spot close to the entrance of the Y. I only had to shuffle the five of them down two blocks of the city sidewalk instead of dragging them all across the busy street. Although a shorter walk, Rose still has plenty of time to open and close her winter coat to show passersby her tankini underneath like a flasher. “We’re going swimmin’!” she tells them in her raspy voice. Once everyone’s changed we charge into the pool area, taking the place by storm. I think the lifeguard pales when he catches sight of us. “Back again?” he asks weakly. Pools bounds up to us with dogged determination, undeterred by last week’s mishaps. I admire her fortitude. And her apparent Alzheimer’s. She greets each child enthusiastically and promises great fun in the water today. Earlier in the day I told Henry he needed to apologize to Pools for calling her face a stinky bum the week before. He giggles and tells her “I sowwy for you. I sowwy I say bad word”. His blue eyes twinkle at the memory. 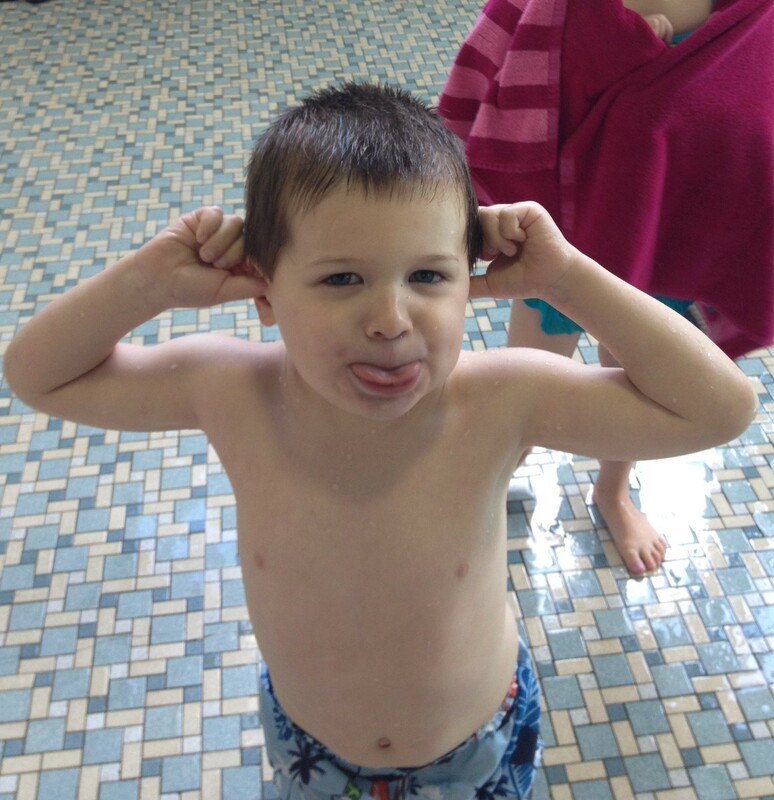 (I consider explaining that he really does not have autism – only Jack does – but figure, nah. I should ride this wave as long as I can.) He can’t help himself and mutters “stinky bum” under his breath when she walks away. I let him in the pool anyway. And so the lesson commences, complete with motorboat games, illegal cannonballs, and frantic screaming. 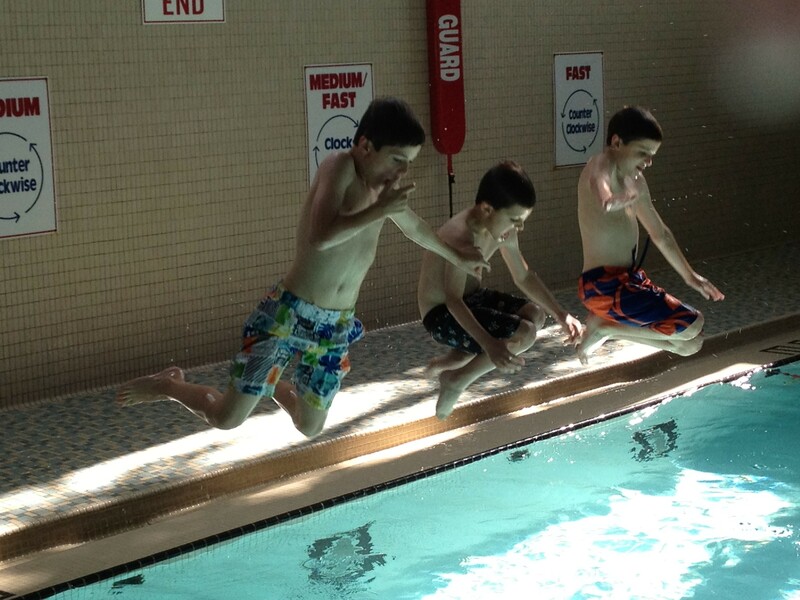 But about halfway through I notice something magical: the three older boys appear to be actually swimming. Not flailing, not sinking, but swimming some vaguely recognizable stroke from one side of the pool to the other. Pools looks triumphant, and rightfully so. This week the focus has shifted from water fun to the vending machines in the Y’s lobby. As we walk out of the pool area, each kid plans the tasty treat they’ll choose and negotiate illogical opportunities for sharing. “You can have one of my gummy bears for three pieces of popcorn.” I frantically check for singles in my wallet. I have exactly five one dollar bills. I turn around to help Henry open his beloved Doritos as he’s screaming “Open! My! Ritos!” at the top of his 3-year old lungs, just as Jack mistakenly puts his dollar in the soda machine. After settling Henry I tell to him that I don’t have extra change for the soda, and that we need to retrieve his money and put it into the snack machine. We push the button. Nothing. Push again. Still no money. With a pit in my stomach I turn to my autistic boy and explain that the machine is broken, and I don’t have any extra dollars to give him. He turns towards the tables, takes in the scene of each of his siblings happily munching, and promptly blows a gasket. “I hate the Y! I HATE it here! I want a snack! I need a DOLLAR!” He is inconsolable, even as one by one three boys and a girl file up and offer to share their treat. I decide the best thing to do is leave. I peer through the window at all five kids bouncing and laughing around the inside of the van. With their usual sibling magic, the four of them have worked Jack out of his mood and are taking turns tossing Cheetos into his open mouth. I guess my award came after all. Amazing what a nice comment can do ~ great post. It’s so tough when you prepare for everything you can think of then there’s the one thing (vending machine in this case) that throws a wrench in a good day.